—or so time is mythically marked and unmarked across the dangerously surreal landscape of Kallie Falandays’ All the Water All the Waves, a razor-brief chapbook wherein we encounter and lose by turns of narrative-lyric panels a faceless face and disembodied body called woman, a figure whose identity is burned and rendered anew with equal measure ferocity and fearless compassion in a meditative sequence not unlike Louise Glück’s book-length constellations or Rainer Maria Rilke’s Duino Elegies. As Falandays’ readers, we are drawn slowly through a nameless, borderless, horizontal territory of poems whose psychomachia, in contrast, drives directly towards the center of the labyrinthic identities assigned to the body, face, and idea of woman. We follow her, then, and in doing so, we are brought close enough to breathe on the allegorical film hovering just over the very real surfaces of the violence, grief, abuse, shame, and neglect to which woman, a body for every woman, is relentlessly subjected. Further still, these figurations only swell to fugue state and fugue state to conjuring, as the poems build with one another and begin to chant. “When woman was dinner plate, it ached.… The thought of herself after everything was gone. The thought of everything after she was gone. She broke and became a monster”—even from the start of this sequence, the language refigures and transfigures woman through a quasi-Darwinian lineage of forms. “When woman was monster she loved no body,” speaks the first line of the poem that follows, building upon the bones of its predecessor. “[W]oman” is cave, among so many things in these poems. She is paper, is art piece, is novelty, is “flashlight…heavy… picked up…battery-robbed so the T.V. could turn on,” we learn here, the transfigurations accelerating to the head- and heart-on collision that is Falandays’ incantation of “Man was walking. Man was deep end. Man was walking. Man was walking…”—a four-page séance which carves the foil figure of male identity into relief and relief to disillusion and dissolution, and in doing so, emphasizing woman’s now-obliterated body. 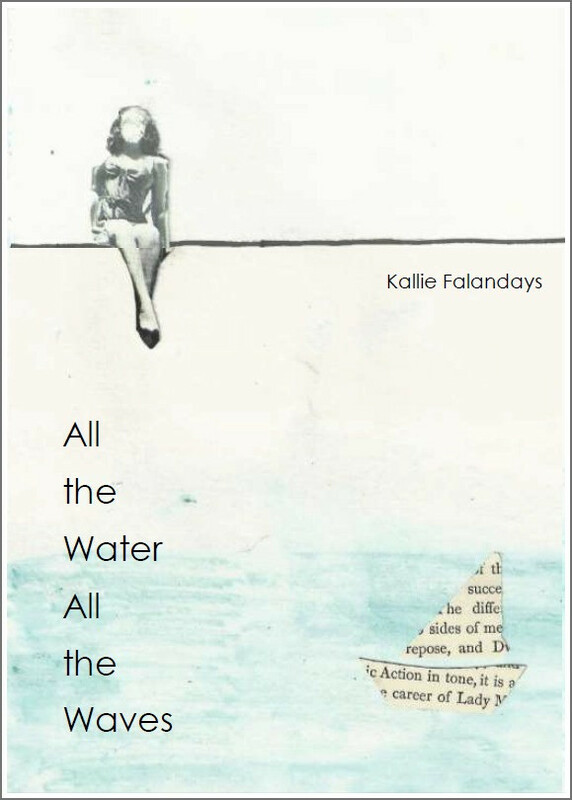 All the Water All the Waves is a chapbook whose ambition is not one of safety or even respite. As a reader, my experience was that of engaged primal anxiety for the correspondence of emergency and resolution in the body of the text and my overall impression, one of intense awareness for trapped female forms within the shape of domestic spaces and objects. We turn our attentions from the blink of these pages back to our lives with their dinner plates and papers and flashlights, and something in periphery begins to rip familiar vision at its seams: the world “coming open like a monster mouth, like an object with veins.” What Falandays starts in woman’s verse is nowhere near over as we close the back cover— it is a slim volume, but if its aim is to keep us watching and waiting, then we live through these pages at the edge of our skin.